I’m a lucky girl this year! My husband hunted down a foot for me for my birthday. Don’t worry he didn’t go all Big Lebowski on me (“A toe! I can get you a toe”) it’s a mannequin foot, but he did admit that it was strange calling up stores asking for a foot. She’s a women’s 8 and I think I’ll name her Lola. 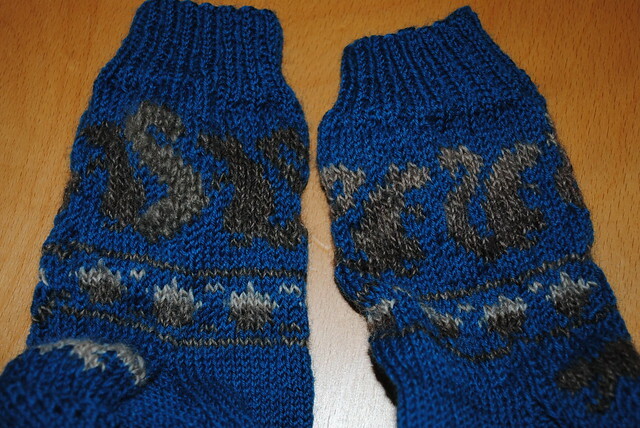 My friend Joscelyn is the first recipient of socks for the year. She has little feet like I do, so Lola’s fit is snug. 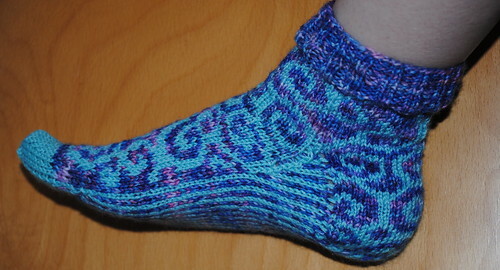 The pattern is Kwalla from Alice Yu’s Socktopus. I was one of her test knitters for the new book. A personal first for me is that I finished a shawl! 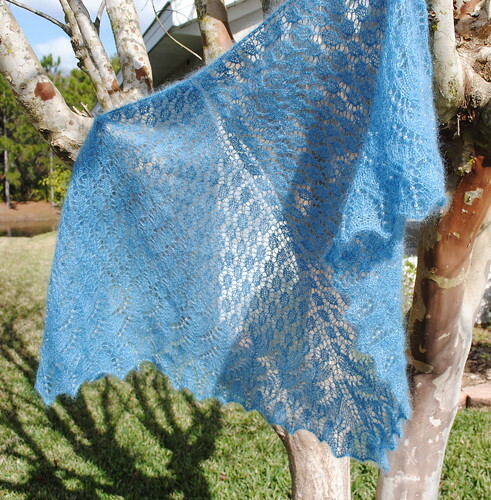 It’s just the Swallowtail Shawl by Evelyn A. Clark. It’s made of S. Charles Collezione Luna and I replaced the nupps with beads. I was smart enough to do a miniature test of them and while they’re an impressive looking stitch, they’re not pleasant to create. Everybody have a fun and safe Halloween! Alan Dart’s Witch in my handspun, Fearless Fibers and Regia. Let her boil over with a little roving too. 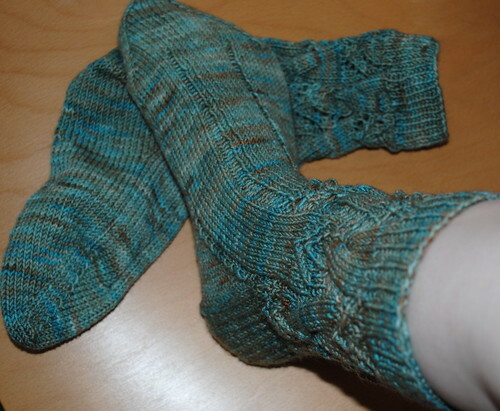 Kimberly made some beautiful socks and I just had to share them because she’s being shy. 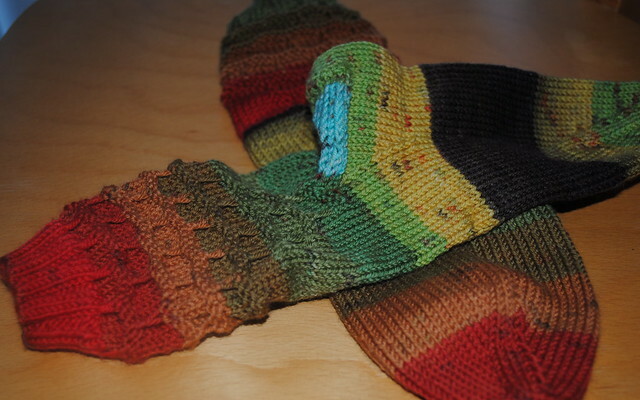 Kimberly was digging through Sip & Knit and found a forgotten sock club batch of Fresh From the Cauldron in a yummy color which will remain anonymous here. 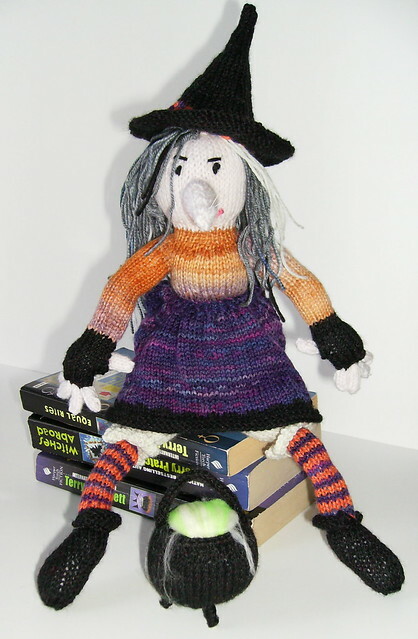 But she wanted it so badly, that she made a sock pattern to get the club moving again. I got to test it on my own yarn of course. It still needs to be washed and blocked (and knitted a couple more inches) but i think its a beautiful lace stitch. oooo Lookie what Kimberly made! I have to make a special thanks to Kimberly for my new favorite sweater. She picked up some maaaalibrigo lace from Stitches South and made the bestest sweater for me! Yes, it’s another pair of socks. I’m always looking for something new to try though. This time I Navajo plied some of Noro’s new lace weight for quite a lovely effect. pattern is modified from Cookie A’s Kai-Mae. 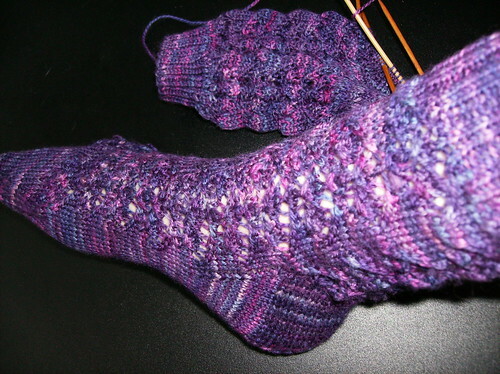 You are currently browsing the archives for What's on the needles.